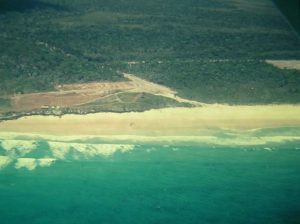 Do you have photos that tell stories of Rainbow Beach? On our recent travels to Caloundra and Bargara, we were delighted to see history was preserved on boards along their coastal walks. In other towns, with history dating back to the 1800s, it is not unusual to find whole museums filled with anecdotes and physical reminders of how communities were built and grown. In town, we have lifesavers on the Surf Club walls, “The Wall of Shame” at Rainbow Beach Tourist Centre, models of ships that have been wrecked at the Sports Club and the Rainbow Beach Caravan Park brings out their huge collection of images from time to time. Perhaps we can have our own history trail, it is all around us – not just Pettigrew’s Cooloola Timber Tramway Complex, Double Island Point lighthouse and Bullock Point Jetty – the only coastal places listed on Gympie Region’s Heritage Trail. The Cooloola Coast is rich in history – just look at how popular the “History of Tin Can Bay” Facebook page is! The photos and stories are bringing back beautiful memories for present and past locals. So when I heard that the Community Information and Resource Centre (CIRS) were hoping to share our town’s history in the Rainbow Beach Community Hall, I felt certain it will be a success. He says, “It’s a chance to promote and be proud of our community history.” We agree Wolf, and the Community News is happy to provide images and publish ones too! So, if you have old photos or memorabilia that tell stories of Rainbow Beach and you are happy to share or donate, drop it in or contact the centre on 5486 3355. Tin Can Bay and Rainbow Beach Year 6 students finished the year on a high.